Some fo you said you wanted a list, so here you go. Incredible job as always DaFool! I still prefer making my own models in 3ds max instead of using fancy conversions. Other than that, good job. I have yet to model my own infantry soon. my custum models look like legos. Besides that, I am doing a service to all those who are talented enough to make decent looking infantry. Do you guys want the cameos I made too? The list is growing very big! Any requests? A sniper dude, A medic and that TOW team. The TOW is done. But I can't provide you with a medic or a sniper. If you want a sniper you can probably put a scope on the american gi. Nah, it's ok, I was wondering if you had them Thanks for the TOW. I'm probably gona do a "fan made" sniper next, seen a Metal Gear Rex & Ray too which could be funky. sweet, do a dude with an M60 kinda thing too please. 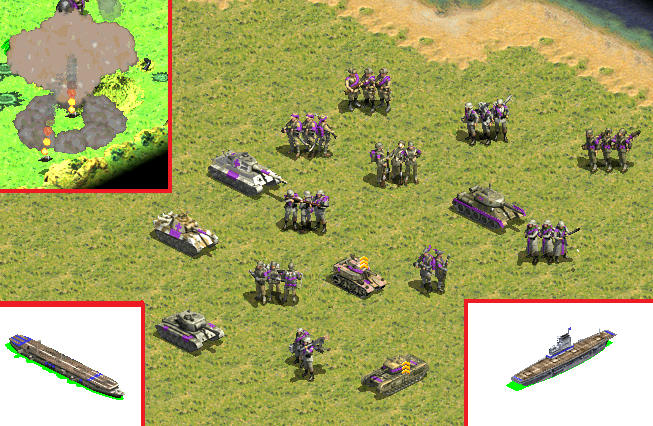 I'm kinda focusing on the units that are in the game right now because they pertain to the mod I am making. Maybe later for mechs and stuff. I'll see if I can get cameos up later. Good luck and remember the combat retardangle. Anything, with enough time luck numbers and enemy stupidity can defeat anything else. I only got 2 more infantry for the world war 2 pack; the german flamethrower and the american hmg. Of course there's still the tanks. But you should be expecting the pack by the weekend. And then....we'll see. This topic should definitely be pinned since it list all of Civ3 conversions made so far. Keep up the good work! I agree with, if I put up the direct download link. How do i do that? Or if you're using Firefox, right click on the download link and then click on "Copy link location". Ok, I put up the direct download links. Can I has a sticky now? Hmmm... How's that US HMG going? Just PM one of the Global Moderators or Banshee to get it Pinned. Can you write sequence for them? There is a death anim for all the vehicles, I just don't know the tag to implement them. It doesn't look like there is an instance of it in ra2. Maybe someone with ts could throw me a bone? The Calvary is a shp vehicle & not an infantry so it doesn't use a sequence. DaFool posted the code you need at the bottom of his last post. execuse me,is that all modern and wwII infantry?or there are something else in the civilization game? 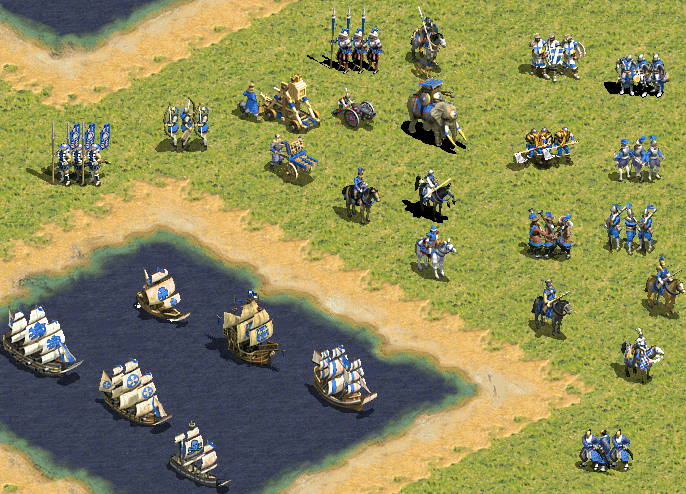 The civilization games also have ancient and medieval infantry, basically ranging from the beginning of time to somewhat modern. The "Ancient Era Pack" and "Medieval Pack " should have these less modern infantry included. Check original post for them. Can anyone help me with this? I don't know much about shp, vxl or else so I post this. It's an infantry (called Luftwaffe Trooper) from commandos 3 (mean World War 2, this game used to very famous), I want a shp (with all sequence and special sequence is swim,paradrop,crewls) if someone can make this/ i really want to say thanks you alot. what company made the game? is eidos. And I will have it for my friend's mod, thanks for your opinion. And of course the credits will show up if i rip this shp infantry. How come none of them have crawl frames? 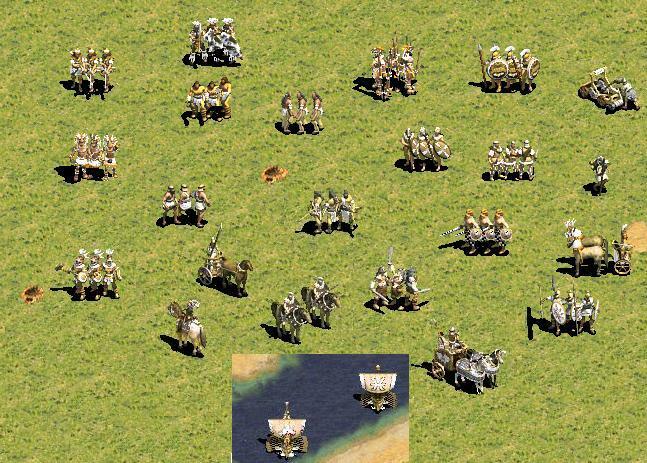 Because in Civilization 3 Infantry only have 4 "Sequences"
There's also Fidget (when it moves to a Guard-like stance) and Win. Those are suitable for Idle and Cheer in most cases. Someone ought to make versions of these in ra2 and ts sizes. yep they should im sure i can make a few TS ones if Dafool wants me to. I think its best to resize in MS paint (longer but looks alittle less square) but meh, Migeater has a point and it is faster. The problem is that it needs 8 facings. You could copy the animation 8 times in the .SHP even if you have only one facing, though, but it will look somewhat odd. Could you look at dates? FYI the stuff was made 3 years ago. 3 ENTIRE YEARS. Both here and Ares bugtracker. You're starting to annoy me with all your foolishness. the stuff was made 5 years ago. 5 ENTIRE YEARS. Well, excuse me. Tho the point still stands. What point? It's sticky ^^. I don't see it so hard, don't be a mad boy dude. Yea, but you don't see he's doing this same on the Ares bugtracker as well. Where no sticky bug exists. This is the third 3+ year old topic he has bumped here too. We had worst user than that, he bump 3 topics wow?. I think he understand it. It was not "bumped", it is on top, damn. How can you "bump" something that never ceases to be on top? And the doubt had never been settled, neither did the bugs there. I actually helped with an answer in this case, about something for the .SHPs that can still be implemented.